Anyone who missed the United Fund of Calumet Ice Cream Social missed more than ice cream and cake. They missed a chance to taste other delicious desserts such as pie and brownies. They missed some great music performed by local talent. They missed hearing a world-renown MC, Debra (Duvall) Peppers. They missed seeing DJ Michael Jones, who kept the music flowing for over two hours. They missed a chance to see and talk to friends, family and neighbors in a fun social setting. Most importantly they missed seeing how a community pulls together. When the last-minute decision was made to change the venue from Clarksville City Park to the Apple Shed because of rain, it took only minutes for Linda and Bill Blakey to open the Apple Shed and prepare for the 4pm event. Mike Smith and his group made short work of setting up tables and chairs. Members of the board of the United Fund of Calumet took on various tasks to set up for serving. Representatives of the organizations that are supported by UF of Calumet also donated time and products. The Raintree Arts Council provided the venue and equipment; Clarksville Museum, cake; Pike Pioneer, pies; and the 21st Century Community Learning Center at Clopton, cake. The following organizations donated their time and energy to help set up, clean up and serve. They include: Clarksville Athletic Association, O.A.T.S., and Clarksville Library. In addition, Orscheln donated bottled water. Everyone came through and needs to be thanked. The community came together to support the organization that supports our community–the United Fund of Calumet. Stephanie Trick is one of the best Stride and Ragtime piano players in the world. She calls St Louis, Missouri home, and thanks to the Raintree Arts Council she will be playing the Appleshed Theater in Clarksville Missouri on Sunday June 10th at 2:00pm in afternoon. If you’re looking for a unique Sunday afternoon a short drive from St Louis or Hannibal Missouri this is it! A discussion about the 2012 Innsbrook Institute Summer Music Academy and Festival. 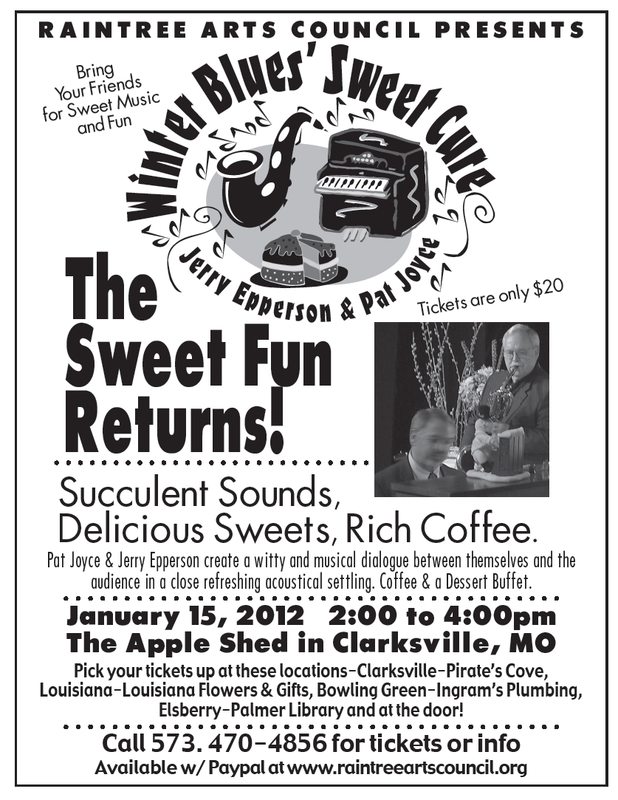 Succulent Sounds, Delicious Sweets, & Rich Coffee to sooth your winter blues. Pat Joyce & Jerry Epperson play music. The Apple Shed is a 90 year old landmark in the town of Clarksville, and the Raintree Arts Council (RAC) has been taking care of it for the last 32 years! You can’t miss the Apple Shed, just off Highway 79 at the south end of town. It’s held many roles over the years. Today it functions as a dedicated location for art in Pike County. 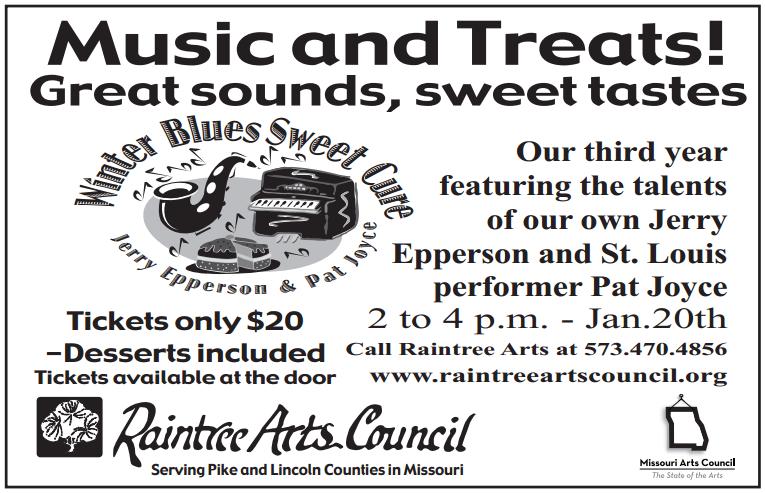 The Raintree Arts Council is dedicated to providing an environment for art to flourish in rural Missouri. The RAC sponsors art and education programs; theater and music performances; and gallery exhibitions for all artistic genres, mediums, and ages. They’re here to help you perform and enjoy the arts. If you’d like to perform or request a performance at the Apple Shed. Let us know. If you’re a performer, The Raintree Arts Council would love to have you perform. Otherwise, they’d love to hear your cultural wish-list.